According to data from the Council of Europe (“Towards quality education for Roma children: transition from early childhood to primary education”, DGIV/EDU/ROM(2007)5), 50% of the Roma children around Europe do not complete their primary education. Some of the reasons that educational research has pointed out in order to explain this phenomenon are that during the child’s early years at home, Roma parents may often lack information and parenting skills to support their children’s language and social development (http://www.ecdgroup.com/pdfs/Preventing-Social-Exclusion.pdf), that the expectations from education are very low, that the social environment in which the children live is characterized by an horizontal way of learning without the rigid school rules, that the oral basis of the language and the absence of books make the school a very different and strange environment for the Roma children (Charoula Stathopoulou, “Roma students at school”, 2005) etc. All these research data highlight the fact that one of the major factors that contribute to the early school leaving of the Roma children is the lack of the proper preparation. Since the school environment is very different from the environment they have been used to live in, they cannot be integrated and therefore the leave the school early. Having considered these issues, the project decided to tackle this problem by training the Roma women to act as intermediators between the Roma children and the school. According to the opinion of the partnership, the Roma women are the most appropriate category of people to prepare the Roma children for the school because they are people known to the Roma children and they share the same culture and living conditions. Therefore, they are in the position to know and understand better than anyone else their constraints about the school education and are able to help them more efficiently. However, in order to do that, they have to be trained. The opinion that the Roma parents do now want their children to go to school has been proven to be a myth (National Committee of Human Rights in Athens, 2001), however it is true that many parents, especially if they themselves have left their school early, have not the necessary parental skills in order to provide their children with the proper preparation. 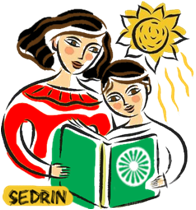 Since it would not be possible to train all the Roma parents in the preparation of their children to school (because of the fact that they will have to work for a living or that they do not have the skills to do that), it was decided that women in the Roma communities (that can be parents, relatives, neighbours etc.) would be perfect to play this role. Therefore, with the proper training of these women the partnership believes that they could improve the inclusion of the Roma children in schools starting from the pre-school age (with information of what the school is about) and ending in the early classes of the elementary with the help to find adequate solutions to problems these children face. These needs were selected above others because the project partnership considers that the main source of the problems of Roma is in the absence of proper education. Because of this absence, the Roma do not have the skills and competencies to find good job positions and therefore they continue to live in the property expanding this vicious circle. The first measure that has to be taken in order to improve the lives of Roma is to improve the participation rates of Roma in the schools. Also, it has decided to tackle this issue because, even if it is a recognized priority, very few things have been made until now for the pre-school education of Roma and the fight against early school leaving. The project is fully consistent with the development strategies of all the partners involved. P1 is an organization very active in the field of European projects concerning education and training, especially in the field of the groups that are in risk of exclusion. It is very willing to test new educational methodologies and improve education and training of Roma children. P2 is a Roma association that is very active in any kind of activity that will improve the lives of Roma communities. Education projects are one of their main priorities. The same is valid also for P6. It is a Roma association very active in the field of training which seeks new opportunities in order to improve the educational level of the Roma populations. P7 is an organization which is dealing with the improvement of the education and the quality of life of the orphan children (especially Roma) and therefore this project is obviously part of their strategy. P3 is a Roma woman association that fights for the empowerment of the Roma women while P5 is an NGO led by Roma focusing on the Roma women. P4 is a university with explicit research interests in the field of Roma education while P8 is a church organisation dealing every day with Roma population and very interested to develop their skills and increase their capabilities. There are many declared European political priorities in the area. In a recent (20/5/2011) meeting in Brussels, Education ministers reached a political agreement to reduce the number of early school leavers. The increase of participation in the education (particularly for the groups in risk of exclusion) are part of the Europe 2020 Strategy and also the Education and Training 2020 programme. The Communication “A European Framework for national strategies on Roma inclusion” was adopted in April 2011 and calls on all member states to develop national strategies on Roma before the end of the year. Special attention is given to the children and early school leavers. All the countries of the partnership have declared as a national priority the reduction of the number of the early school leavers. The project is a new innovative idea developed by the partners. It is based on the results of empirical and desk research regarding the needs of the Roma children but is not part or continuation of another project. 3 out of 5 partners of the project (P1:Action, P6: Maranatha and P7: FSFCA) had previous cooperation in the field of another project co-financed by the Fundamental Rights & Citizenship programme of the European Union called ROMA SOURCE and coordinated by Leeds City Council.